Hot and Sunny is the only way to describe this past week. The first few days were difficult but the action picked up towards then end of the week. The Grand Cascapedia is getting low but we are still taking fish on the upper pools where the water is a bit cooler. The Bonaventure and Petite Cascapedia are still running cool despite the hot weather, levels are still good. We have been doing well on the Bony and the Petite. Hopefully the weather man smiles upon us. 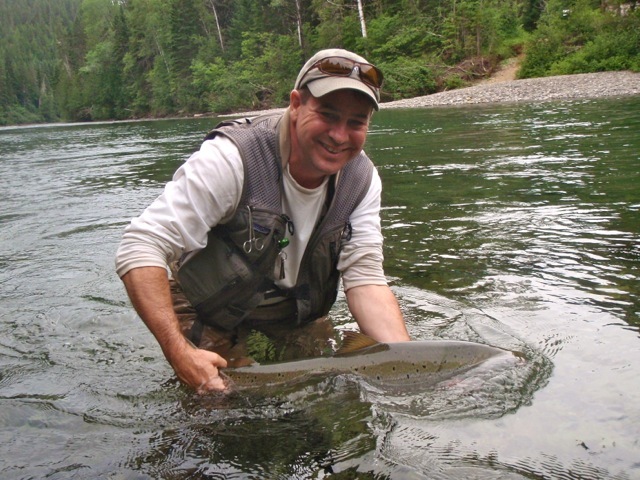 Raymond Ploudre releases a nice Bonaventure salmon, Congradulations Ray! The hot fly's this past week have been dry's. Brown, Green and Blue Bombers in sizes 4, 6 and 8. Tubes and small wets have been producing as well.